What would you eat in Paris if you could only spend 10 euros? 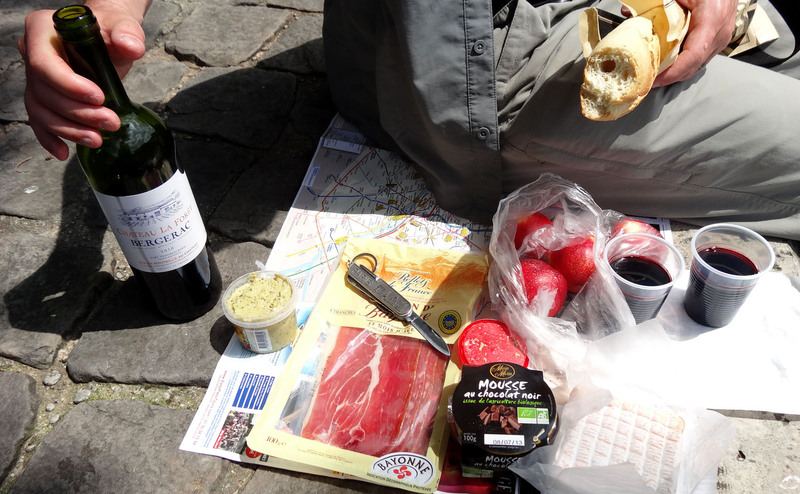 Would you buy a baguette, a wedge of cheese, some fruit and a cheap bottle of wine and picnic around the city? Would you search for the cheapest hole-in-the-wall creperie? Or maybe a side-street boulangerie? Blue Palate blossomed out of my love of this kind of puzzle. As a traveler on a limited budget, I’m always hunting for the best meal for the least amount of money. Sometimes this leads me to foreign supermarkets. I can spend hours in the junk food aisle hunting for the strangest flavor of potato chip, or browsing mysterious cheeses in the dairy section, or learning the national geography in the wine aisle. Other times it means sampling the street food, or researching which restaurants are tourist traps, and which cater to locals and serve fresh, authentic food for the best prices. Blue Palate is ever practical, like finding the best cevapi at the bus station in Sarajevo. But it’s also a bit glamorous, like noshing on Greek mezes and ouzo while overlooking the beach. We’ll discover what other people around the world eat, not just the fine cuisine at restaurants, but what fills their grocery bags too. We’ll find out how they take their coffee. We’ll cook what they cook and share an occasional recipe. Hang around, sink your teeth in, but watch out, you might end up hungry.